For many of my clients, friends and family, this week has been a helluva rough ride, and being positive is pretty tough in the face of what our future President promised and elicited in many of his followers on the campaign trail. While I appreciate that some, in fact many, Americans are happy in the immediate, post-election moment, most I work with, play with and simply love are struggling with the many stages of shock, grief, fear and anger right now. And, while there’s nothing I can do to undo the realities of this election outcome, there are a few things I can offer for hope, encouragement and perhaps inspiration. A lone dunlin, staring into the middle distance on a barren, rocky island mirrored my emotional state on Wednesday. When I woke on Wednesday morning, I was numb. My emotional disbelief that day can only be likened to the dull sense of denial that accompanies learning a close loved one has died. But, having gone through tragic loss more than once in my life, I knew that being outside, in nature, does more to rebuild my belief in goodness and in the future than anything else. I also recognized that the natural world I love so very much is now at dire risk of collapse under the command of the forthcoming administration. Before mid-day I had started the process of becoming a volunteer at the Padilla Bay National Estuarine Research Reserve near our home. I’m not sure yet how they’ll put me to work, but I offered to give native plant tours or classes or even just sit at the front desk as a greeter during open hours. It doesn’t matter how I help — just that I do help. After I’d signed up there, I took a long walk on the PBST (Padilla Bay Shore Trail) to clear my head and connect with the greater natural world. Migrating geese honked as they flew overhead. Great blue herons stood like statues in the soggy fields. 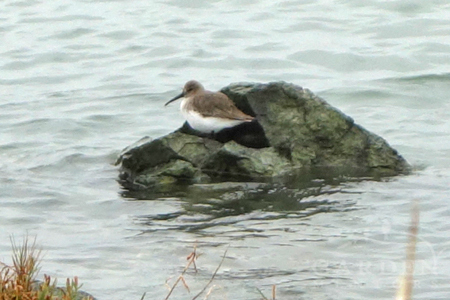 And, exhausted dunlins hunkered on the rocks at the salty, windy shore. Their presence recharged me, but it was also telling to think that the forthcoming administration’s position on climate change threatens the delicacy of our Earth — not just human life, but the life of all flora and fauna. These birds that are powerful enough to fly from the tundra to the equator and back every year may soon disappear from our landscape completely. So, upon my return home, I reached out to our local Audubon chapter to volunteer. 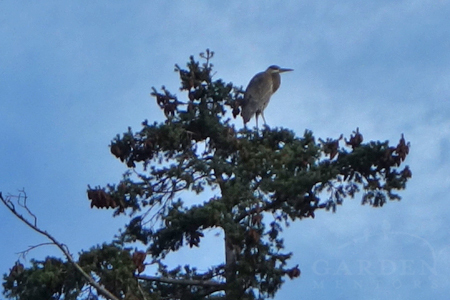 Like a great blue heron guarding territory, it is even more imperative that we guard our Earth in any way possible. By Thursday morning, I woke up angry. The fog of disbelief had begun to give way to the cold, hard truth of our future. Despite waking to a gorgeous sunset, the day felt grim, but I forged ahead. 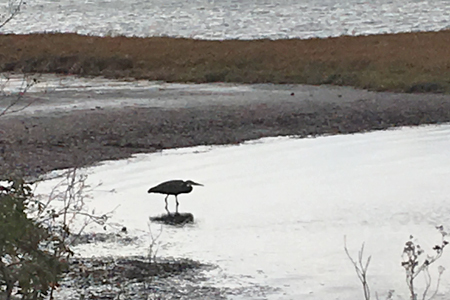 I wrote a check to the local Audubon chapter as I sat watching a pair of great blue herons battle for frog-pond territory out my office window. And, following an afternoon walk on the PBST where I smiled and said hello to everyone else on the trail, I began working on a couple of new programs Garden Mentors plans to offer to our subscribers as early as next week. We’re working on programs that we hope will empower even more people to have more positive impacts on the planet and each other in the immediate and the distant future. 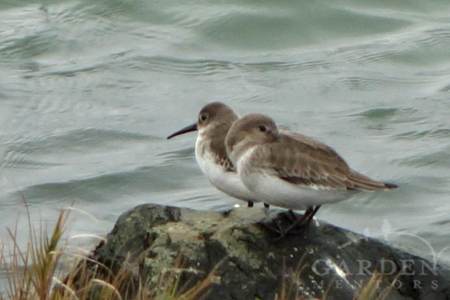 Like this pair of dunlins, you are not alone. You may be staring off into space in disbelief or curling inward to mourn, but together we can build a better future. Friday morning this blog post goes live. I can only hope the new day dawns beautifully for each of you. I hope the divisiveness and hatred endorsed by our President-elect becomes the part of every candidate’s campaign promises that immediately fall by the wayside upon being elected. And, I hope he does everything possible to reunite our dangerously divided society. I hope for our nation’s unified future and our planet’s endurance. And, I hope you will join me in doing everything we can — in even the smallest ways — to ensure a strong, united, respectful, loving and peaceful coexistence for all beings in our nation and on our entire planet. If you wish to learn more about our forthcoming programs, I encourage you to sign up for our mailing list now. I find myself slogging through the days right now, attempting to navigate the morass of the 2016 election season, muddled domestic and foreign political affairs, and an equally swampy autumn. Great blue heron slogging at the shores of Padilla Bay in search of sustenance. Our record-breaking October monthly rainfall numbers were so high in all of Washington state that no part of the state is still considered droughty. And, where we live, it’s downright swampy. At least that gives us an excuse not to mow. But, will we ever get the last of our bulbs planted. And, if we do, will they just rot in this year’s chilly, waterlogged soil? 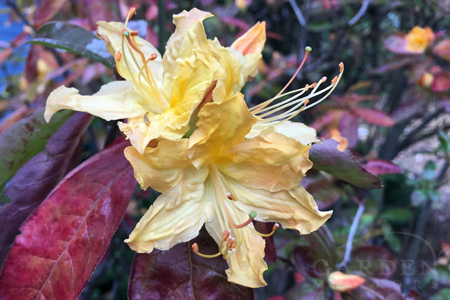 Azaleas are usually considered spring bloomers, but look carefully and you may catch them putting on fragrant fall flowers like this that pop against their colorful fall foliage. What a treat! On these dim, wet, gray “indoor” days, it’s easy to get mired down watching the non-stop ugliness of politics unfold on television and the internet. But, here’s the best medicine I’ve found: get outside — even if you do get wet. There’s nothing like breathing fresh air while observing the natural world to liberate our hearts and minds. Some days I dig into the garden, planting bulbs and trusting in a future that will not only let them grow but also encourage them to thrive. Other days, I take a long walk at the shore with my pup, admiring the power and determination of migrating birds flapping into the storm — something that happens every year regardless of who we want for our next President or Senator. Always, I carry a camera in hopes of capturing a moment of the miraculous beauty of nature. These images help me get through the next downpour, the next tragedy at Standing Rock, and, of course, the political quagmire leading up to November 8th. August went out with one big, wet, raging Hurrah! in our garden — a sure sign autumn is coming. All-night lightening, thunder and raging downpours hammering onto our roof and surging into leaf-clogged gutters turned the calendar page from August to September. 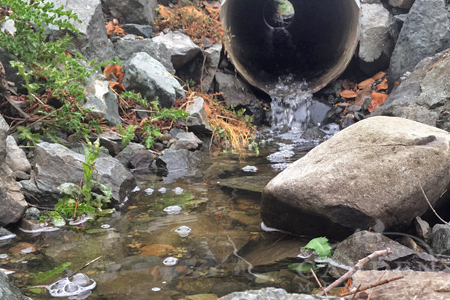 When a heavy rain hits hard following summer’s drought, streams are easily overloaded. Not the case in this well-managed culvert. Remnants of the storm lingered in the early September 1st morning. Streams raced through downhill culverts. Below, a previously low pond now lapped at its brim. And, the scents of autumn had washed away the dirt-dry smell of a departing long, hot summer. 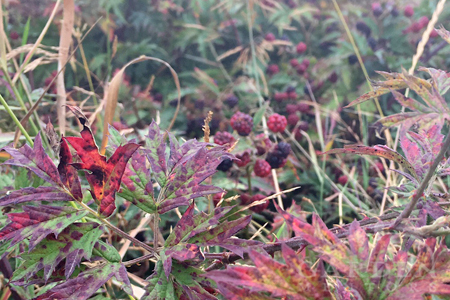 As summer turns to fall, blackberries may still offer fruit, but its likely to be pithy. But isn’t the leaf color lovely this time of year? We’re certain to revisit hot, dry days again before fall really arrives in earnest. 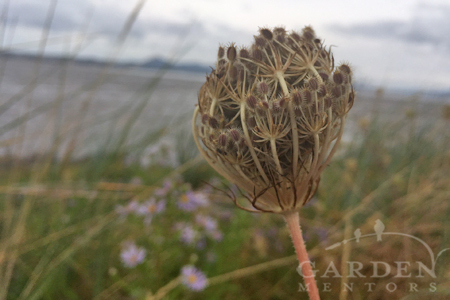 Flowers transform into beautiful seed pods by late summer. Soon, a windy day will send these Queen Anne’s lace seeds far & wide to sprout next year & offer ideal breeding grounds for beneficial soldier beetles & other insects. But early storms and other harbingers of fall are a good reminder that soon it will be time to get new plants in the ground, renovate (or transition away from) lawn, rake leaves, plant spring bulbs, mulch and all those other tasks best completed in our all-to-brief autumns. 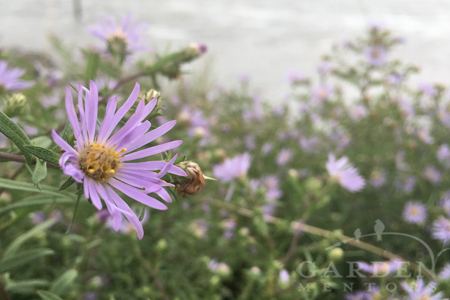 Wild asters like this Douglas’ aster (A. subspicatus) blooming at the shore is sure sign summer is winding down. Right now. Drink in the last of summer. Harvest. Preserve. Play croquet. Take a walk to soak up all the late summer goodness around you. Watch for bird migrations beginning. Pick berries. Chase frogs. Have fun! 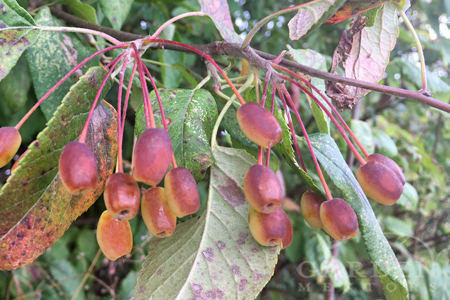 Tiny wild crabapples begin to flush color as they ripen in late summer. Soon cedar waxwings, starlings & other fruit-loving birds will flock to the trees & gorge themselves on these sweet morsels. 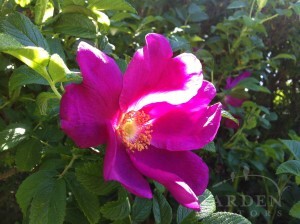 And make your gardening plans to hit the ground running when summer really, truly, finally says good-bye. 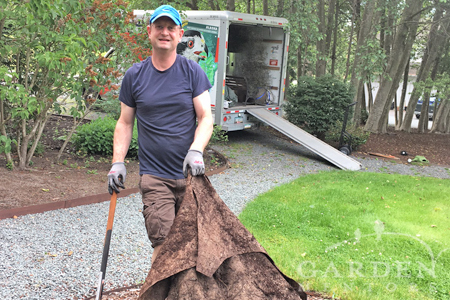 As most Garden Mentors clients and blog readers know, spring has been a time of big change for me — including changing gardens. Usually in June I’m writing articles about transplanting tomatoes, harvesting garlic scapes and what’s stinking up the garden with its fly-attracting bloom. This year my June gardening focus has completely reset. My well-studied garden in Seattle is now in the hands of others, and my new garden north of Seattle in Skagit County is challenging me with all sorts of opportunities — some welcome and some not-so welcome. 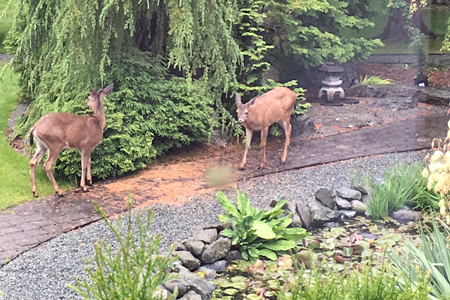 Wild animals like deer are abundant in our new garden. Raccoons, rabbits, chipmunks, field mice, moles and voles are just some of the mammals scurrying about. Lots of vultures, hawks, herons, ducks, hummingbirds, cedar waxwings and other birds make our garden their home too. Because we now live in the country on a couple of wild fauna-filled acres, my tomato patch is growing in containers on a deck. Once he pulled away the abundant landscape fabric, Bob put a beatdown on the clay with his fantastic IsoCore Fiskars pick-axe (provided to Garden Mentors by Fiskars for free to trial; we have received no compensation for using this axe or mentioning it in this post). For the first time in a very long time, I haven’t had the time to get a new gardening post live for our readers first thing Friday morning. Being consistent in sharing news, tips and great gardening images has been a goal I’ve been proud to meet for many, many months now. Alas, a cellphone meltdown followed by a computer hard drive crash lead to days without technology. Couple that with racing to move our home and offices, and, well, I think you get the picture. Fragrant wild rose blooming fragrantly on a very warm spring day at the Breazeale Interpretive Center upland Meadows. What was rosy? Visiting the Breazeale Interpretive Center at Padilla Bay before the technology meltdown began. It was a very hot day, and the upland trail meadows were buzzing with life: swooping swallows, flittering butterflies, buzzing bees and a multitude of gorgeous, fragrant wild roses. I’m glad I took the time to stop and smell these roses. Thinking back to that lovely day when the rest of my world became a techno-disaster helped me stay calm and remember the world is still a wonderful place to be. Thanks for your patience everyone. I hope to see you at the Spring Green Art Fest tomorrow, Saturday May 7th at 1:30pm, for my seminar Growing a Year Round Hummingbird Garden!